My first­born received Mr. Willowby’s Christ­mas Tree (by Robert Bar­ry) from his best friend for Christ­mas 2001. I know this because their names are scrawled inside the front cov­er with the date. I prob­a­bly could’ve nar­rowed it down to the right year, though. He was four, she was three. We read it count­less times that Christmas—and for a few Christ­mases after, too. Alas, he is now a senior in high school and she a junior, and I have not sat between them on the couch to read the sto­ry in a num­ber of years (though it does still sound like fun). I very much remem­ber how they loved it when they were lit­tle, how­ev­er. They’d laugh at how tree after tree scrunched into the ceiling—their chub­by fin­gers point­ing to where the top of the tree would go next…. The sto­ry is one of sharing—inadvertent shar­ing at times, but shar­ing none-the-less. Mr. Wil­low­by (who has a charm­ing han­dle­bar mus­tache) lives in a grand home and orders his very tall Christ­mas tree to be deliv­ered by spe­cial deliv­ery. When they stand it up in the spa­cious par­lor win­dow, the tree top touch­es the ceil­ing then bends like a bow. “Oh, good heav­ens,” gasps Mr. Wil­low­by. “Some­thing must go!” So Bax­ter, the but­ler, chops off the top and car­ries it on a sil­ver tray to Miss Ade­laide, the upstairs maid. When she tries to stand it on a table in her mod­est liv­ing quar­ters, the same thing hap­pens. So she snips off the top and throws it away. But Timm, the gar­den­er, takes it home. He and Mrs. Timm love the tiny tree top, which is just the right size for their snug, small house—or will be once Mrs. Timm trims the top and throws it out the win­dow…. On and on, the top of Mr. Willowby’s tree is shared—the Bear Fam­i­ly trims it, the Fox Fam­i­ly lops off the top, the Rab­bit fam­i­ly chops it off and final­ly Mistle­toe Mouse pulls the very tip-top branch or two through the snow and ice to his cozy house. And there, it is just the right size! They top it with a star of cheese and Christ­mas friv­o­li­ty ensues. 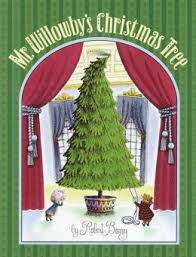 The last page shows Mr. Wil­low­by asleep by his grand Christ­mas Tree and through the mouse­hole in the base­boards, we see a match­ing (though much small­er) tree with the Mistle­toe Mouse fam­i­ly danc­ing around it. I remem­ber the day (read­ing 157?) my son asked why they chopped off the tree on the top vs. the bot­tom. “So they could share,” his friend said. “Oh!” said my son in a light­bulb moment. And then they asked to read it again. It remains one of my favorite Christ­mas books. This sounds absolute­ly endear­ing! And a char­ac­ter named Ade­laide … Could we ask for more? !